We have to experience all kinds of difficulties throughout our lives. Sometimes they come all of a sudden and you have no idea about it. But all in all, we need to face them bravely and move on. By dealing with various difficulties, we can receive valuable lessons of life. Read these inspirational quotes about difficulties in life which will be very helpful to encourage you to face any unexpected situations with strength and courage. In order to become a great person, we need to strengthen our character in facing difficulties. When difficult moments come, it is very important to keep going. We must perceive difficulties as a chance that life gives us to let us know better about ourselves and people around us. Facing difficulties is not easy but it will make you stronger in the future. Be faithful to what you are doing and you’ll move the rocks. We must learn to see opportunities to become better every day. In order to know the joy of our success, we need to taste the bitterness of our challenges. We must stay calm no matter what is happening. Because only through the darkness, we are able to see the light. Sometimes we need to be just silent and have the patience to overcome our challenges. 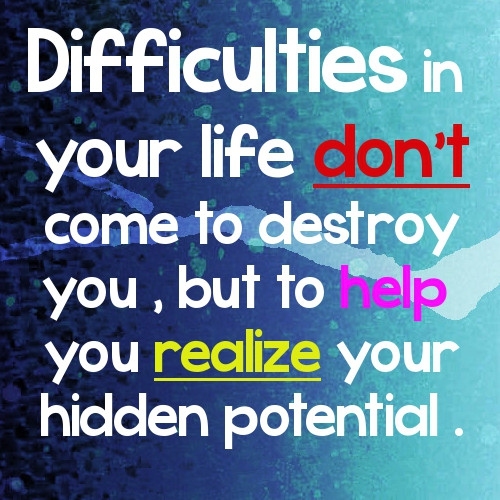 Difficulties don’t hurt people and they are going to help you find your potential. Don't be afraid of the difficulties in your life, because they can be defeated by you. We have to face those difficulties by our own strengths. The night is darker before the dawn. On the road to achieve your goal, there are always difficulties. Difficulties make us stronger and more powerful. Life always gives us chances to become better. In order to change something, we need to get out of our comfort zone. Every challenge is an opportunity to change something in our life. The only thing that matters is whether you have the necessary amount of faith to achieve your goals. Difficult people, we meet in our life, are here to teach us. Life lessons are different for different people. Quotes about difficulties in life show that in every difficult situation there are a great number of ways out. The God always gives you as much as you can handle. Never regret what happened in our life. We never know where we could be without our difficulties. If we could learn to read the signs that life gives us, we would never be at the most difficult situation ever.